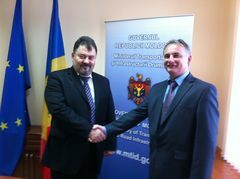 The meeting of Mr. Eduard Biriucov, Secretary General of the PS IGC TRACECA, and Mr. Anatol Salaru, Minister of Transport and Road Infrastructure of the Republic of Moldova was devoted to discussing the on-going issues within the framework of the TRACECA corridor. The Secretary General emphasized the importance of prioritization of the relevant issues, including the institutional strengthening of TRACECA. The meeting was also devoted to discussing transport matters and the prospects of further development of the “Europe-the Caucasus-Asia” transport corridor as well as the Action Plan for the year of 2011. On the outcomes of the meeting participants stressed the necessity of joint efforts of all concerned national and international organizations in the context of traffic development and the increase of the TRACECA corridor competitiveness and attractiveness.